Some have speculated that there could be an impending social media exodus. Many books, Christian and not, have been written recently about pulling back from phone use, curtailing social media activity, and other like themes. I have read many of these books and have changed some of my own habits. They are super helpful. However, the publishing of books about the perils of social media and increasing negative sentiment regarding social media do not mean there will be an exodus from social media anytime soon. Just look at Facebook. Despite an apocalyptic year full of terrible stories about privacy violations and poor content moderation, their usage remained stable. As long as the internet exists, there will be social media. Social media will change forms. Some will opt out. But I would bet my house that at least 75% of Americans will be social media users for the foreseeable future. The last few springs, Pew Research Center has published new data on social media usage in the United States. This year’s data came out just last week. I wanted to write on it right away, but I was preparing for a long weekend vacation in NYC and had to prep my workload for that. Finally got some time to look at the data this week. Let’s look at five of the biggest trends revealed in the data. 1. YouTube is the biggest social media platform in the world. …but most people don’t see it as a social media platform. YouTube is a social media platform. Countless hours of video are posted every day and millions of people are watching and commenting on those videos. Media is posted and social interaction happens around that media. The survey says 73% of Americans use YouTube, and 51% of those people use it every day. The platform is most popular among the youngest Americans surveyed. About 90% of Americans ages 18-24-years-old use YouTube, and 93% of Americans ages 25-29-years-old use it. The survey didn’t poll Americans younger than 18 (because they aren’t really allowed), but I am certain the usage statistics for Americans under 18 are near those of Americans ages 18-24. 2. 51% of American adults use Facebook “several times per day”; 74% at least once per day. Facebook is no longer the “newcomer” in the social media world. Facebook is the grizzled veteran of the social media world, and it has had a heck of a year. It seems like there is a major controversy every week regard Facebook in some form or fashion. However, despite the constant bugaboos that hound Facebook—whether it be how they use our data or the kind of content they allow on their platform—its usage remains steady among American adults. Obviously, Facebook would like to see a growth in the usage of its platform among Americans, but considering the year it’s had, maintaining its usage percentage isn’t the worst thing to happen. 3. There is an 18% disparity in Instagram usage between 18-24-year-olds and 25-29-year-olds. I am 28-years-old, and I am shocked that there is such a disparity between my age group and the folks just a few years younger than me. The disparity is pretty stunning. I mean, 25-29- and 30-49-year-olds have more in common when it comes to Instagram usage! Basically, college-aged students use Instagram much more than their peers who are new to the post-college world. This is likely due to the fact that Instagram came onto the scene when current college students were in roughly middle school. Instagram was more ingrained to the social lives of our current college students than it was for people closer to my age. America’s 25-29-year-olds received Instagram in college while its 18-24-year-olds received it in middle school. This, I believe, is the primary reason for this surprising disparity in usage. 4. Facebook is the most popular social media platform among senior adults. …I mean…is anyone really surprised? According to the survey, 46% of Americans 65+ use Facebook. YouTube comes in second at 38%. I believe Facebook is most popular among seniors for a number of reasons, but primarily because it was the first social media platform that pervaded senior adult culture and because, for many of them, Facebook is all about connecting with people from the past, like Classmates.com used to be. If you only looked at that statistic, you would be tempted to think that Facebook will die when its users do—so many people on Facebook seem older. But the most prolific users of Facebook are actually the 25-29-year-old demographic, as 84% of them use Facebook. But this isn’t super surprising. Why? Facebook became the dominant social media platform when 25-29-year-olds where in middle and high school, just like Instagram did among the 18-24-year-old demographic. Is there a trend here? Is it possible that whichever social media platform came into the lives of Americans in their adolescent years is the one most likely to stick with them into post-college adulthood? I think there is a case for that. I think it is more likely that today’s college students stick with Instagram for a long time rather than migrate to Facebook as they get older. But who knows? Time will tell. 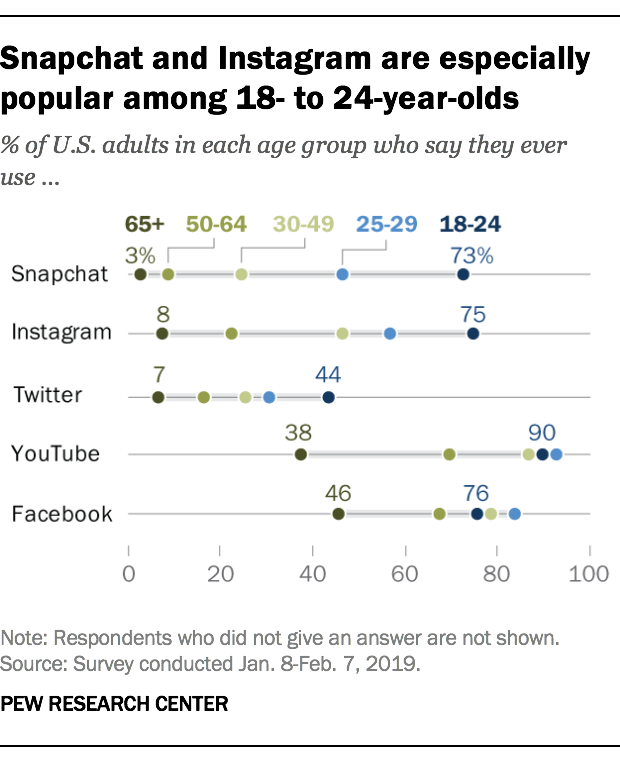 Facebook is technically more prevalent than Instagram among 18-24-year-olds right now (76% versus 75%), but if you know any college students, you know that they actually use Instagram much more than Facebook. 5. There are more Americans who use LinkedIn than use Twitter. According to this data from Pew, 27% of Americans use LinkedIn and 24% of Americans use Twitter. When you see super “woke” people on Twitter raging about why the latest “problematic” movie star deserves to be “canceled” because of something they said in a text message 10 years ago, remember just 24% of Americans are even on that platform and an even smaller percentage is paying any attention. Twitter is home to some of the loudest social media activism, and yet it has fewer users than the corporate social media platform that spams emails every day. I love Twitter, but its influence on our overall culture is overstated, despite the fact that the leader of the free world uses it as his primary communication platform. All of this is to say: social media isn’t going anywhere anytime soon. It will change in the next decade. Some people will opt out of social media. Some will limit their usage of these platforms (I know I have). But if social media survived the incessant bad news about Facebook and YouTube this year, it can survive just about anything. The task for us is to learn how to use it wisely. It isn’t going away. Just look at how 2020 candidates are already using it. Daydreaming about what “a world without social media looks like” steals valuable time away from learning to live in a world in which we are governed through it. Forget a world without social media. Learn to live in a world shaped by social media. Read Pew’s article on its data here. Is a Social Media Exodus Imminent? More to come on these charts from Pew later this week. When I graduated college in 2013 and entered the realm of “professional social media manager” for a world-renowned Christian leader and avid online content creator at one of the largest Christian organizations in the world, I was an idiot. But before we get into that, let’s take a minute to explore what I’ll call the “Christian Social Internet.” This context will provide a basis for my self-reflection. This makes me sound old, but 2013 was a much different time in the Christian Social Internet than it is today, event though it was just six years ago. Stage 1: "Hey cool. We can connect with people around the world." Stage 2: "What you think is wrong and you're a terrible person for thinking it!" Stage 3: "If we disagree I'll just pretend you don't exist and only interact with people who agree with me." In 2013-2014, the Christian Social Internet was, in my view, at Stage 2 of this progression. Much of the in-fighting I was watching can be summarized most simply as a warring of worldviews between conservative evangelicals (Southern Baptists, PCAers, Reformed folks, etc.) and liberal evangelicals/Mainline protestants. For example, I remember many a Twitter battle between Rachel Held Evans, Joe Carter, Jonathan Merritt, Jared C. Wilson, and others. Rachel and Jonathan would often contend for a more liberal view of a particular issue, while guys like Joe or Jared would contend for a more conservative view. In my newfound role as social media manager for a well-known Christian leader, I spent a significant amount of time monitoring the conversations (read: “fights”) among Christians arguing about everything from what makes someone an “evangelical” to whether or not a megachurch pastor who has a moral failing can ever lead a church again. I would say that, though there is division and fighting among Christians online today, it doesn’t quite match the intensity and fervor of what was going on in 2013-2014 (but some may disagree). Much of the division centers around political issues, whereas the division in 2013-2014 often related more to theology or overall worldview issues. It was like the internet brought thousands of vocal Christians together on Twitter and when they all realized they didn’t think the same way about important issues, they fought for social confirmation of their rightness. In public. Before a watching world. I think that, in large part, much of the Christian Social Internet has moved to Stage 3 of the progression given in my tweet above. I think many evangelical and liberal evangelicals/Mainline Protestants have come to realize that they are not going to get one another to agree on biblical sexuality, the role of women in the local church, or other hot issues. It almost feels as though the warriors who once patrolled the Christian Social Internet have retreated to their homelands, now more interested in building up their own citizens than winning battles and seizing cultural territory. The battles were unhealthy. They were unhelpful. None of the combatants left convinced or converted. They earned clout among their like-minded peers, but no land was actually won. I speak as one who observed these wars, but I didn’t just observe them. Remember what I said at the beginning? I was an idiot. I tried to enter some of these battles as an infantryman. That’s where I messed up. I played myself. I remember standing in the eight-foot-long kitchen of our Nashville area apartment making dinner with my wife and furiously tweeting at people like Rachel Held Evans or Jonathan Merritt to tell them how dumb and misguided they were. I also remember receiving phone calls from various people at work telling me that I need to stop tweeting. I showed up to fight in a battle to which I wasn’t invited in order to take a stand no one was asking me to take so that people who don’t know me would see how smart I was. I was so mad at people peddling what I thought were lies that I was willing to spend hours of my days tweeting at other people how wrong they were. As if they needed some 22-year-old kid to right their theology and worldview. I was arrogant. I was pursuing my own glory. I was satisfying an urge. Yelling my two minutes of hate into the void. It was a different time. It was, perhaps, more acceptable to do that back then. But that doesn’t excuse how I acted. I messed up. I shouldn’t have done it. I sinned against a lot of people. I was one of those people about whom friends of mine would say, “Yeah, but he’s not like that in real life,” when defending my idiocy on Twitter. What a shame. Foolishness. But a lot has changed since 2013-2014. The Christian Social Internet has become more ideologically segregated, which is maybe a good thing (depending on who you ask). I have become a much more spiritually and emotionally mature person. God has graciously sanctified me by his Holy Spirit. Life goes on. This past fall, I was given a new responsibility that has drastically affected the way I interact online in general, but especially on the Christian Social Internet. This is where this post gets a bit dicey because I don’t know how much I’m allowed to say here, so I’ll say enough to make my point and not say more than I should. I manage the @LifeWay social media handles. When you tweet @LifeWay or engage with the @LifeWay Facebook page, that’s my desk. That’s my work. That’s me. I took the keys for the @LifeWay social media handles this past October when a colleague took a job at a different company. I haven’t crashed the car yet, despite the spotty driving record we just reviewed. A lot has happened at LifeWay since last fall, if you aren’t aware. Namely, we just announced a shift in focus toward a more “dynamic digital strategy” which will result in the closure of some of our LifeWay Christian Store locations. Between that and some changes in leadership, it’s been an active first few months to be running the @LifeWay social media handles. Perhaps the most fascinating part of managing the @LifeWay social media handles, particularly the Twitter handle, has been observing the wide variety of negative feedback we get about an assortment of issues. But internet hate is the way of the road these days, even (perhaps especially) on the Christian Social Internet. Watching all of the reaction around LifeWay’s recent announcement humbled me. Something silly I like to criticize is ESPN’s botching of the Monday Night Football program. They’ve had the program for years and I’ve always thought it’s terrible, as have most people on Twitter, it seems. I think they try too hard. Their commentators are too over the top. They Disney-fy it too much. But what do I know? With what authority am I able criticize ESPN’s (mis)handling of Monday Night Football? Am I a television programming expert? Do I know what makes a good football commentator? Do I have any right to call out one of the largest entertainment companies in the world on how they handle a program? So often I don’t know the whole story, and I act like I do. It didn’t click with me how foolish I am to do something like that until I saw all of the errant criticisms of the erosion of LifeWay retail stores. I was humbled and I recognized my own foolishness. It’s really transformed how I interact with social media. I haven’t left any social media platforms entirely like some of my friends have, but I have dramatically changed how I interact with them. I deleted the Facebook suite of apps off my phone long ago, except the Pages app, which I need for work. I deleted the Twitter app from my phone, but still access it on my web browser from time to time. The more annoying interface of the web browser makes me use it less often. I go back and forth between being logged into my personal Instagram account. I have to have access to the LifeWay Instagram at all times, though, so I can’t delete the app. I created an anonymous Twitter account for lurking when I’m working so that I am not tempted to tweet dumb stuff from my personal Twitter account when it comes to mind during the day (because I’m on Twitter all day for work stuff). I stopped following anything on Twitter that made me mad and exclusively use it as a platform to engage with people and things I enjoy: friends or professional contacts, funny comedy accounts, or various accounts in my areas of interest (sports, gaming, social media culture). It’s super difficult to “leave” social media when it’s your everyday job and when you genuinely enjoy so many bright parts of it like I do. But it is helpful to deploy guardrails that can assist in a pursuit of sanctification and wisdom. My relationship with social media and the Christian Social Internet has matured a lot in the six years I’ve been creating content for a living. I went from needlessly entering Twitter fights I had no business entering to managing the corporate accounts of one of the largest Christian resource providers in the world. God has done a work, amen? But he’s not done working, either. Which is why I’ve taken many steps to protect against any foolishness that still seeps out of my fingers from time to time. The Lord has taught me the merit of shutting my virtual mouth more often than I have in the past. But into the throng of noise steps the command from James – the command to listen. Not tweet. Not broadcast. Not Facebook Live. But listen. Amen. Let’s run our mouths less and listen more. When we’re tempted to take up arms in virtual battles over frivolous issues, let’s remember that the war’s already been won.